Recipe: Vegan Quinoa Paella. Brazil Nut, Citrus & Spices! I love Spanish Paella. 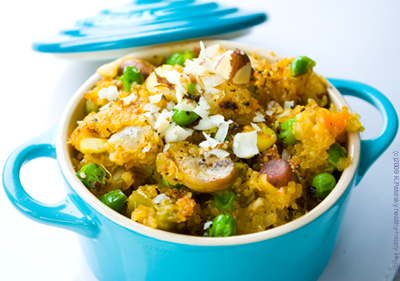 The lightly burnt rice, silky sauteed onions, crinkly peas, and that hypnotizing warm saffron aroma. Tapas bliss. So when I was brainstorming creative ways to prepare super grain quinoa, a traditional paella dish served as my inspiration for this recipe. Why Quinoa? Quinoa is higher in protein than most other grains. One cup of quinoa has 8 grams of protein and around 200 calories. White rice? Also 200 calories and only 4 grams of protein. Quinoa, light and fluffy when cooked, makes a great substitute for rice in a paella dish. And selenium-rich Brazil nuts add the perfect crunchy accent dish. 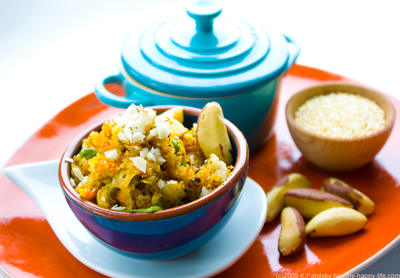 This recipe for Quinoa Brazil Nut Paella combines the flavors of crunchy Brazil nuts, traditional paella veggies, citrus, garlic and saffron. It is accented with a few spicy ingredients like cayenne and roasted peppers. Serve this dish with some red sangria and you have an amazing Spain-inspired meal, done vegan style. with citrus, garlic and spices. Re-cover and allow to cook on low heat for five minutes. (This should add a nice browning effect to the bottom layer of quinoa. Tip: For the fresh green pea look, leave out a few steamed bright green peas and fold then into finished dish. Grab your best sangria recipe to compliment this dish!